Former MLA Reverend Robert Coulter has died, aged 88. The Ulster Unionist politician served as an MLA for North Antrim between 1998 and 2011. 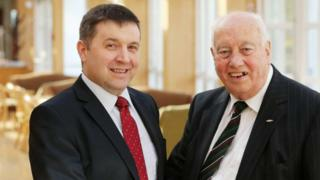 Ulster Unionist Party (UUP) Leader, Robin Swann MLA paid tribute to Mr Coulter MBE, stating he was "a mentor and a friend". "Bob was a stalwart of Ulster Unionism in North Antrim and personally to me he was also a mentor and a friend," he said. Robin Swann said Mr Coulter had a long record of public service. Mr Swann said: "He was passionate about education and particularly for children with special educational needs. This was reflected in his role as a key advocate for the recently opened new build for Castle Tower School where he was Chair of the Board of Governors. "Following in his footsteps in North Antrim, I was always aware of the high bar that had been set by him. He also paid tribute to Mr Coulter's wife and two children.